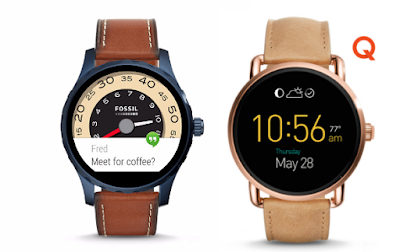 If you own a Fossil Smartwatch which is Q series , which is Fossil Q Wander, Q Marshal, or Q Founder, then you can now upgrade you Fossil to Android wear 2.0 for standalone apps, cleaner navigation and enhanced fitness features. When Google announced Android Wear 2.0 was finally ready to ship, a bunch of watch makers lined up to be first to push out the new update. Now, Fossil is among the first to make good on its promise, announcing it has begun pushing the new OS to its trio of smartwatches. Owners of the Fossil Q Wander, Q Marshal, and Q Founder can now enjoy all (well, most) of the new features of Android Wear 2.0, including the standalone apps, an on-watch Play Store, improved navigation, and fitness enhancements. However, since the original batch of Android Wear watches weren’t built with NFC chips inside them, they won’t be able to take advantage of the new Android Pay support. To install the update, swipe down from the top of the screen, and continue swiping right until you see the Settings gear icon. Tap it and scroll down to the bottom until you see About. Tap it and then tap System Updates, and follow the instructions to download and install the new version. Fossil hasn’t yet announced any new watches built specifically for Android Wear 2.0, though presumably the company will introduce new models later this year.